The National Police Department warned all its personnel to obey international rules of detention and to stop using unofficial detention centers days before a delegation from the Committee for the Prevention of Torture (CPT) was to pay a visit to Turkey in order to ascertain if people in custody are subject to any maltreatment, according to an anonymous tip received by Turkey Purge. The CPT delegation was in Turkey to carry out inspections between Aug. 28 and Sept. 6. The delegation’s visit came amid widespread allegations raised firstly by Amnesty International, which stated that it had collected credible evidence that detainees in Turkey are beaten, tortured and on some occasions raped in official and unofficial detention centers across the country. 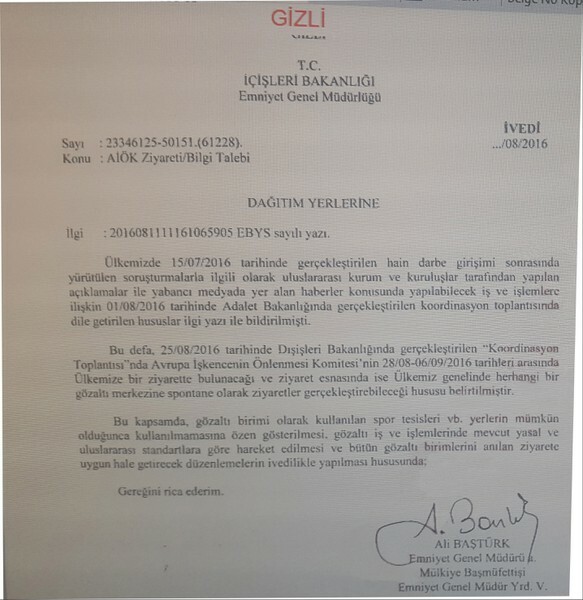 In a classified letter sent ahead of the CPT visit and provided to Turkey Purge in the anonymous tip, the acting deputy head of the Turkish National Police warned all officers about the visit and ordered them to avoid using sports facilities as detention centers during the delegation’s stay in the country. The official also asked police officers to obey international rules of detention while the delegation was in Turkey and ordered them to reorganize all detention centers and to make the centers ready for the inspection as soon as possible. Among the locations where detainees are reported by media to have been tortured or subjected to maltreatment are Ayas Prison in Ankara’s Sincan district; the gymnasium at Ankara Police headquarters, the gymnasium at the Ankara Police Academy; the Special Forces headquarters in Ankara’s Gölbaşı district; the solitary confinement cells in Istanbul’s Silivri and Ankara’s Sincan prisons; a warehouse behind Ankara Police headquarters; the gymnasium at Diyarbakır’s Gaffar Okkan Police Academy; and Diyarbakır’s Bağlar gymnasium. A room immediately next to the attorney-detainee meeting room in Istanbul’s Vatan Police Station is also believed to be among such locations. “… It was stated during a coordination meeting at the Foreign Ministry on Aug. 25, 2016, that the CPT is set to pay a visit to our country between Aug. 28 and Sept. 9, 2016, and that it may conduct spontaneous inspections on any detention center across the country. In this respect, I request you to show the ultimate attention to avoid using places that serve as detention centers including sport facilities; to abide by our own regulations and international standards concerning detention procedures; and to urgently make arrangements in order to get all detention centers ready for the abovementioned visit,” read the classified letter from the acting deputy head of the Turkish National Police, a copy of which was provided in the anonymous tip. CPT is expected to publish its final report on the post-coup attempt visit to Turkey in November. In the aftermath of an attempted coup on July 15, the state-run Anadolu news agency unabashedly shared photos of tortured soldiers who had been detained over their alleged involvement in the coup bid. Media also reported that several detainees have recently committed suicide while in prison.